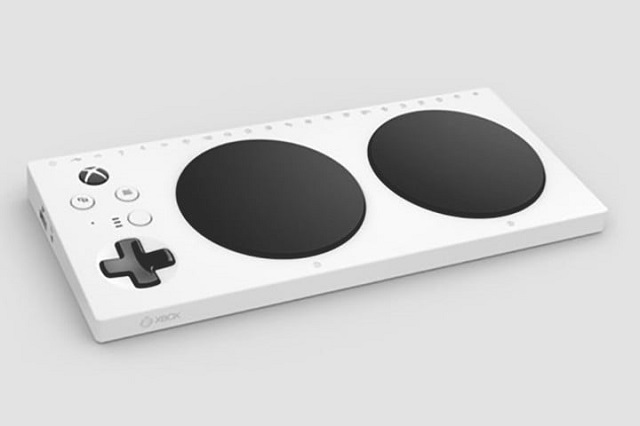 Microsoft seems to be developing a new Xbox One controller specifically for accessibility. A leaked image of the prototype popped up on Twitter thanks to WalkingCat, and Windows Central reports that it has heard the controller will likely be unveiled sometime at E3 or even before the big event. The prototype above doesn’t resemble a normal gamepad at all. The first thing that stands out are the two large, raised buttons that comprise most of the controller. These “A” and “B” buttons look to be programmable and will help gamers who do better with touch than sight. Without thumbsticks, the four Xbox One face buttons, bumpers, and triggers, the A and B buttons will have to handle a variety of inputs. The three LED lights seem to correspond to the programmable functions, with the white button toggling user control schemes. Assuming it's true, good on them. That may make things easier for my uncle. At first I figured, if MS wanted to make gaming more accessible, that they'd put a picture of the PS4 on their advertisement. This would be great, one of the guys at work doesn't have much motion in one of his thumbs and he would like to play games and he can't because everything is twin sticks. Awesome, now my cat can play Tetris! I don't know why the link in the original post goes to a 404 now but here's the video showing the controller in action being used by a bunch of retards*. Seems pretty cool and also ripe for other uses besides games. Seems like MS should expect to release an SDK for it one day, like they did with Kinect. *If you took offense I know who the real retard is!